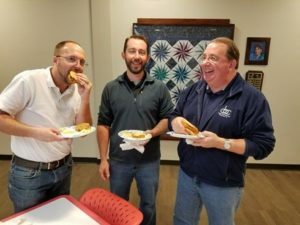 Microspace’s (l to r) Josh Clary, Chris Tomblin and John Bimrose enjoy Chick-fil-A sandwiches to celebrate close of successful 2017 United Way Campaign. Microspace Communications participated in the 2017 campaign for the United Way of the Greater Triangle. Microspace staff enjoyed a campaign kick-off bagel breakfast and a campaign wrap-up luncheon of Chick-fil-A sandwiches. This year’s campaign also included food drives collecting cans of tuna and jars of peanut butter. These were given to the North Carolina Food Bank. Microspace raised a total of $8,790 in this year’s campaign, making this a very successful year.